﻿ Mobile weighing: getting it right means being able to weigh and count "on the spot"
Within efficient supply chains, products must arrive just in time and in correct amounts-by weight, count, or volume. How can you check? Mobile, battery-powered scales have driven changes in weighing processes in many warehousing, distribution, and manufacturing environments. These scales can be quickly located in the most effective areas to optimize facility process improvements and reduce the number of scales needed. Why engage in these practices? Applications include material handling, inventory control, shipping & receiving, warehousing, order fulfillment, cross-docking, and uses in security-sensitive environments. 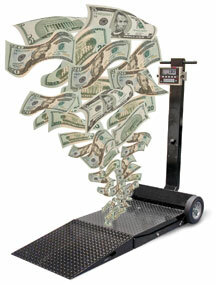 We can help you configure your mobile weighing solution to work within your system and for your application. For instance, pallet jack scales let you weigh and transport your load right on the pallet (whether it’s going out or coming in). Because an accurate weight can be taken of an entire shipment, you don’t need to calculate shipments by individual product weights, plus pallet weight, plus dunnage. It’s a real time-saver. Another possible solution are these Mobile platform scales. They’re a completely flat and stable surface to use during weighing procedures. The platform is able to weigh perfectly on all corners, meaning that off center or uneven weight distribution won’t affect the accuracy of the scale. You can fit them with a ramp and roll a hand truck right on for easy weighing.